SOYBEANS: What is on the horizon this coming season? Global soybean production for 2018/2019 is projected at 354,5 million tons. Brazil’s production is expected to remain flat at 117 million tons while Argentina, has recovered from the drought and it is expected that their production will increase by 17 million to 56 million tons. The Department of Trade and Industry (DTI) came up with an import replacement strategy for soybeans a couple of years ago, this stimulated production as well as increased capacity in soybean crushing plants in the country. Over the past decade, soybeans have been the fastest growing field crop in South Africa. With soybean planting season approaching, it seems like the trend will continue to grow. The previous season was a good one, with 573 950 ha planted and a final crop of 1,316 million tons, this was mainly attributed to good weather conditions. For the 2018/2019 marketing year the Crop Estimates Committee (CEC) has estimated the area planted under soybeans to be 787 200 ha, with a production of 1,551 million tons and an expected yield of around 1,97 t/ha. Mpumalanga remains a major soybean producer with 554 300 tons produced in 2017/2018 and production is expected to increase by 127 700 tons to 682 000 tons in 2018/2019. Followed by Free State with production of 504 000 tons in 2017/2018 and this is expected to increase to 552 000 tons this coming season. In 2017, soybean prices fluctuated around R4 600/ton, which was a 29% decline year on year, due to lower international prices and a strengthening rand. For the upcoming season Safex prices are projected to trade between import and export parity (Graph 1), with derived price for cake and oil determining a relative benchmark for the local price (Table 1). Landed Durban 47% protein soybean oilcake: Price at which soybean oilcake with a protein content of 47% can be imported (free on truck, Durban). Hulls: Price that soybean hulls are selling ex soycrushing plant reef. Income: Income from various components after solvent extracted crushing of soybeans in a commercial crushing plant. Crushing costs: The minimum income required to cover crushing costs. Soybean transport: The average cost of transport of soybeans to the crushing plant. Price to producer on farm: The intrinsic value of soybeans on the farm considering all the cost and income component to crush soybeans (solvent extracted) and realise a minimum margin. 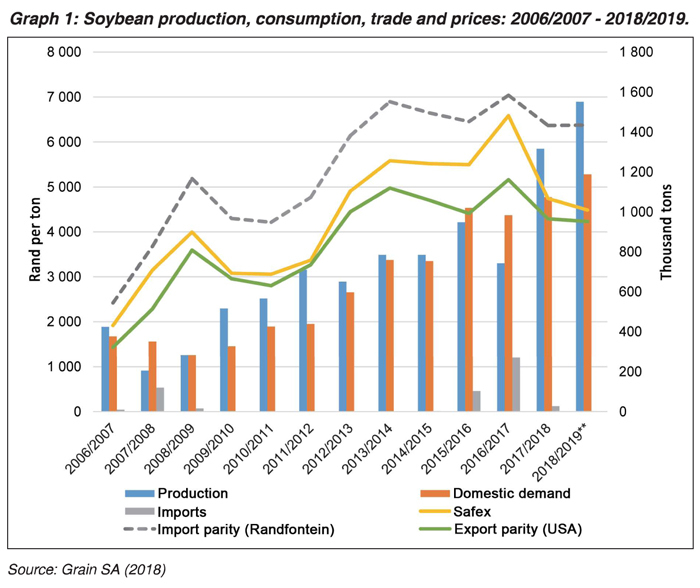 For South Africa’s soybean market to continue growing and eventually become self-sufficient, we need to utilise maximum crushing capacity of 2,5 million tons for both soybeans and sunflower. This will then require a significant reduction of imports than what we currently receive; soybean importers within the country need to start buying local produce and measures need to be in place to stop oilcake that comes into the country at a price below our production cost.